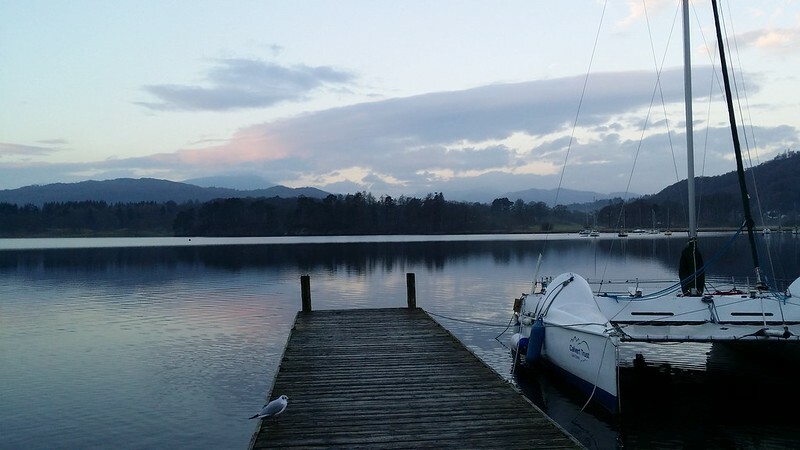 All is dark when I finally arrive in Windermere, after some nail-biting moments on the train journey up, wondering if I would make my connections at Preston and Oxenholme. Not wanting to wait for the bus, when there’s a taxi right here, I hop in the car and minutes later am at Ambleside youth hostel, timing my arrival for a mini-flood of people waiting to check in. There’s just time to sort out my kit, throw a quick snack and a pint down my neck and retire to bed. I’m up just before sunrise, although it turns out to be a bit of a tame affair, but more importantly a calm and dry one. A morning routine is put into effect, consisting of choking down some instant porridge in the hostel followed by grabbing a bacon roll at a sandwich shop in town and then waiting for the bus. 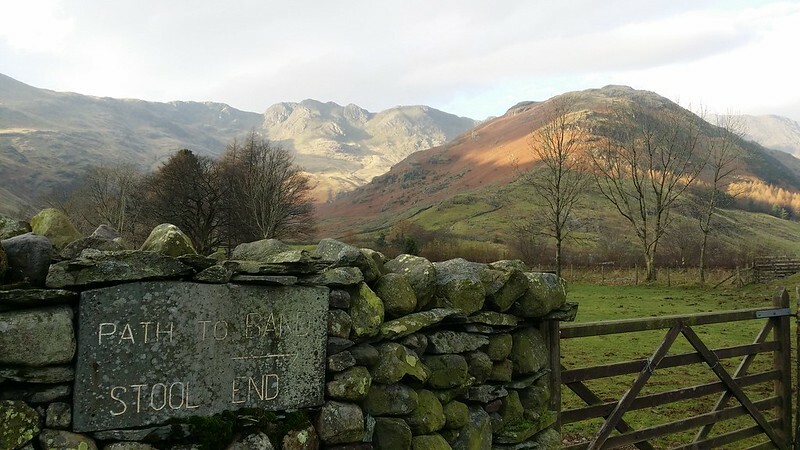 Today’s bus takes me out to Langdale, the promise of a decent forecast luring me out to tackle a walk I’ve always felt a little cheated by. 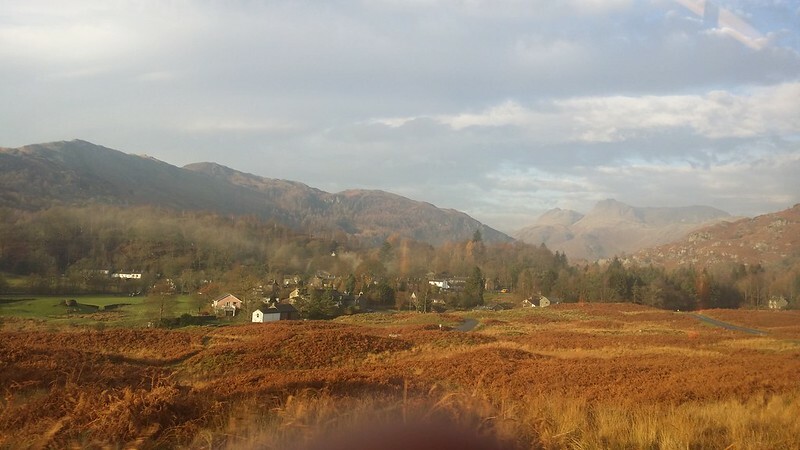 It’s several years since I last visited the Lakes in the full glory of autumn, and not surprisingly my eyes are glued to the bus windows as I look out at the sea of spicy colours on each side. Nowadays, I tend to think of these automatically in terms of the equivalent paint colours in my palette, especially so in autumn with its rich harvest of raw and burnt siennas and umbers breaking up and enhancing the array of remaining greens. 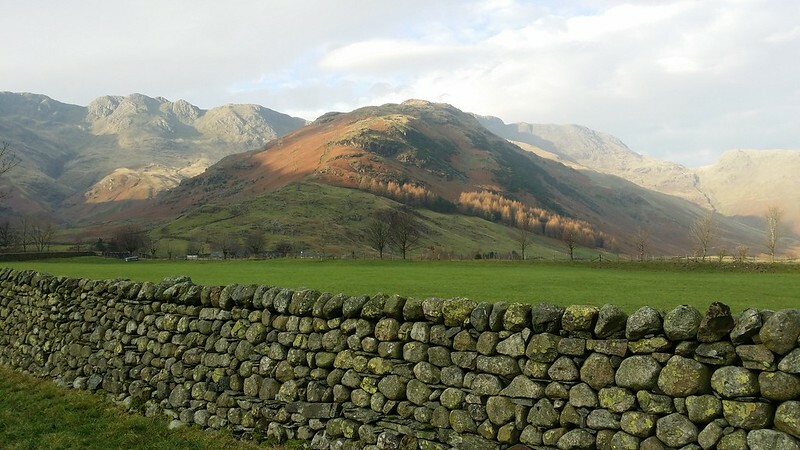 Forget going to New England “for the leaves”, you can get all you need in the Lakes. I set out for Stool End Farm, last visited on an escape from a dreary and morale-sapping day on the Crinkles. Today’s route takes me back up the Band, respendant in its new coat of russet accentuating the rocky outcrops that watch over Mickelden. 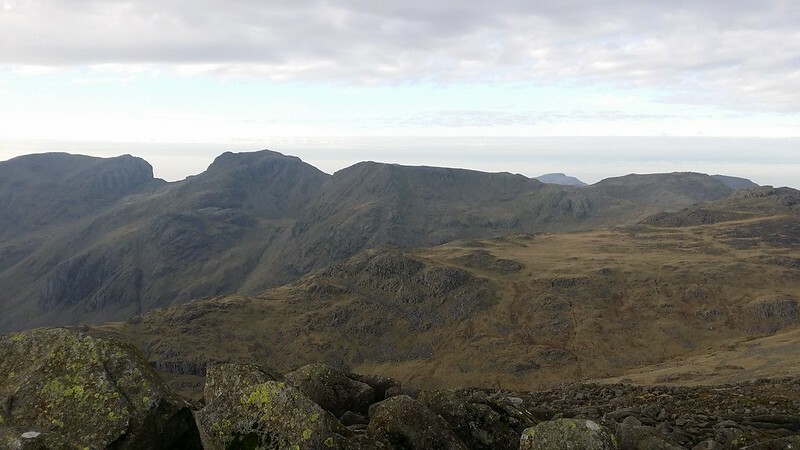 I climb up onto the ridge and it gently takes me higher up towards my main goal – Bowfell. But not before a small detour to complete some unfinished business. I’ve been along this path 4 or 5 times now, and never once have I visited the high point of the Band, which is after all a Birkett. I climb over a succession of grassy rises before I find one that looks and feels like the top, and whose altitude appears to match. 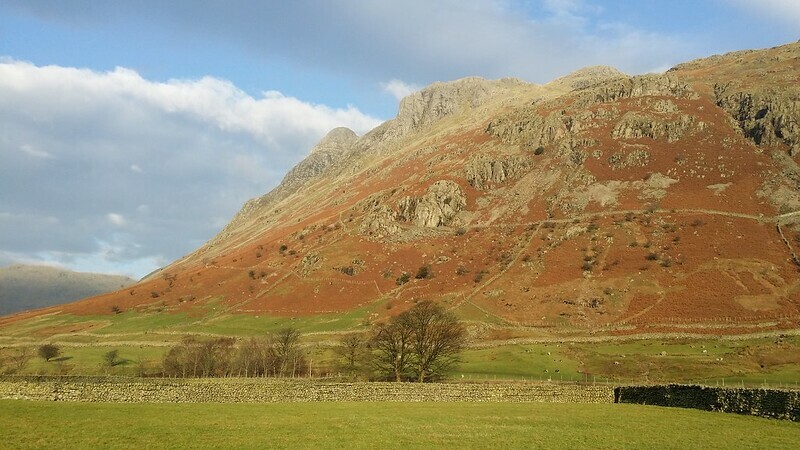 A pause to allow the bag to be captured on Social Hiking is no trouble as it gives me a good excuse to look back into Langdale, and especially at the Pikes themselves which look magnificent with the weak autumn sun highlighting them. A bit of exploring along the ridge, partly to make sure I’ve visited the actual top, but also for its own sake – as this little area off-path is surprisingly interesting. 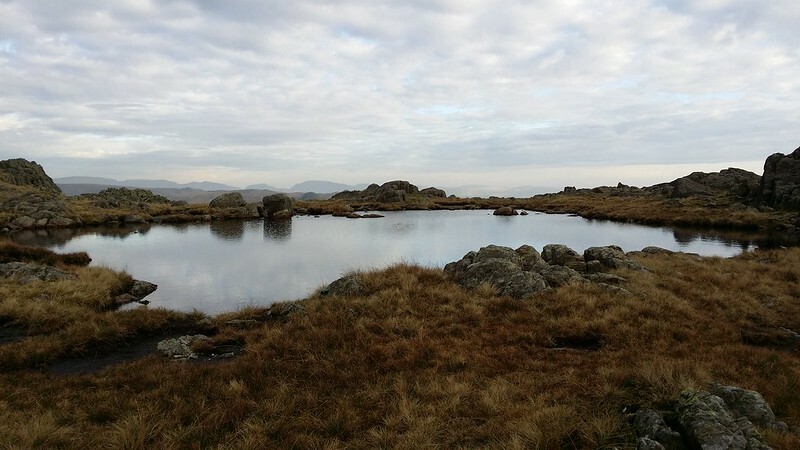 I even find a couple of little tarns and some spots that might afford a nice camp spot in the future. 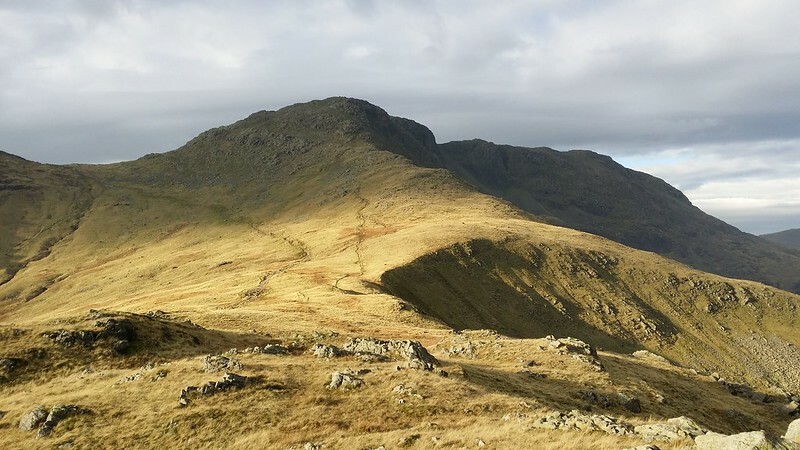 The sun is now playing on the upper section of the Band, as if lighting the way to the top of Bowfell. 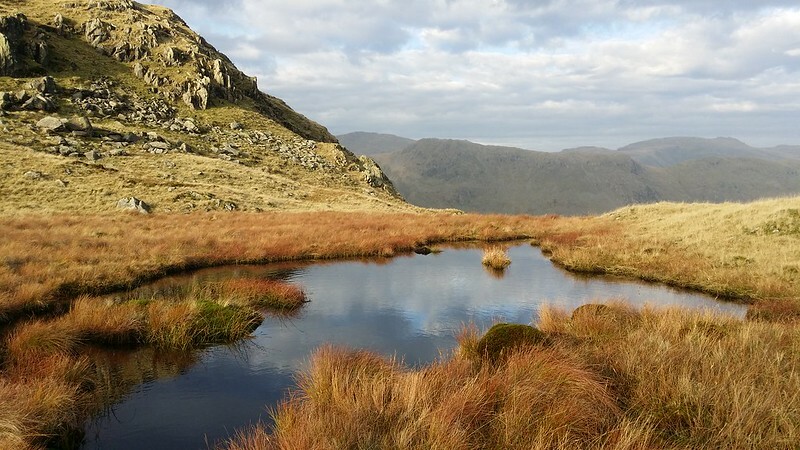 I rejoin the path that grinds its way up to Three Tarns. 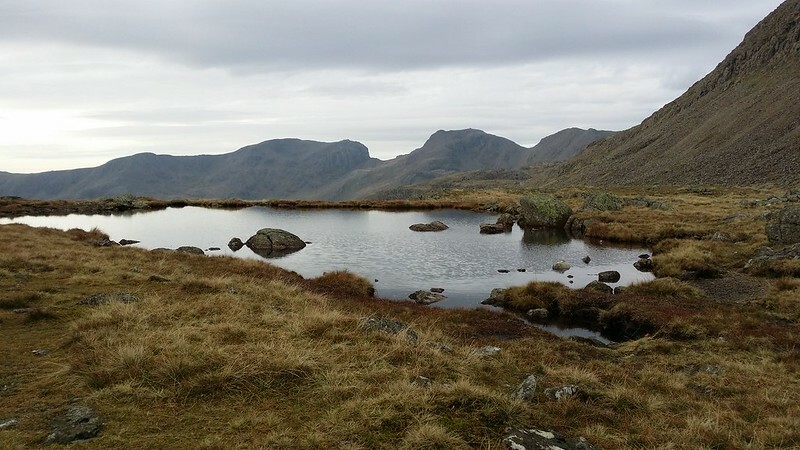 Three Tarns looks a lot more attractive today than on my last visit when it afforded precious little respite from the wind and rain that was trying to scour us from the fells. So today I take my time, and explore all 3 of the tarns, taking far too many pictures and generally reccying the area for future visits. 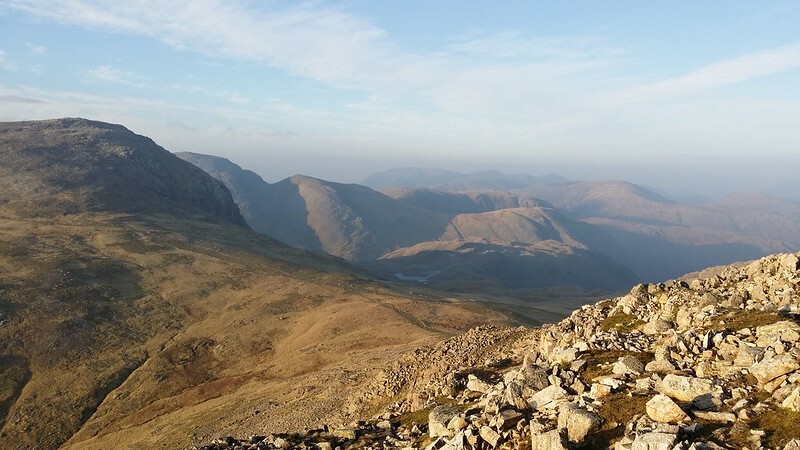 Conscious that I’m now starting to put off the sharp pull up to the top of Bowfell, I make myself get on with it, slogging it out slowly, and taking a few tactical pauses on the way up to “let others who were faster get past”. It’s only a couple of weeks since Dartmoor, but that really wasn’t much of a workout in comparison to a walk in the Lakes, so I’m feeling it, especially after a week sat in a classroom. But then if it wasn’t for the fact that the classroom was right opposite Euston Station, I might never have had the idea of taking advantage of that and squeezing in an unexpected Lakes trip. 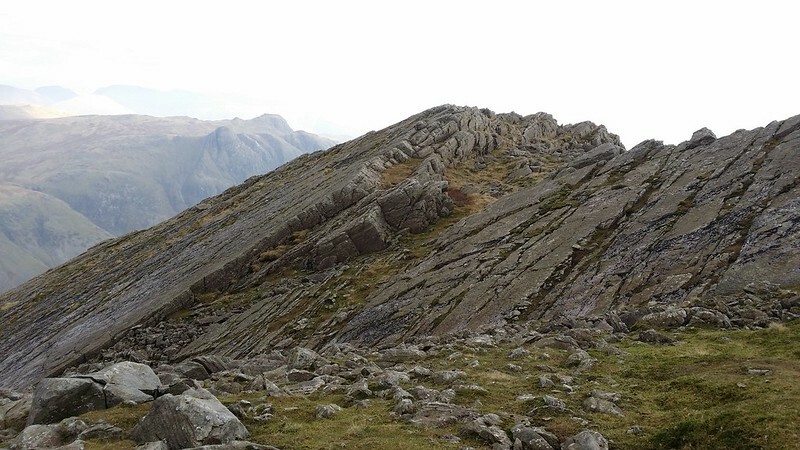 The gradient eases and I’m on the rock strewn plateau, heading off to the right to take a peek at the Great Slab. Sadly as I return to the path there’s no one nearby to give the wrong idea to that I’ve just come up via the Slab. 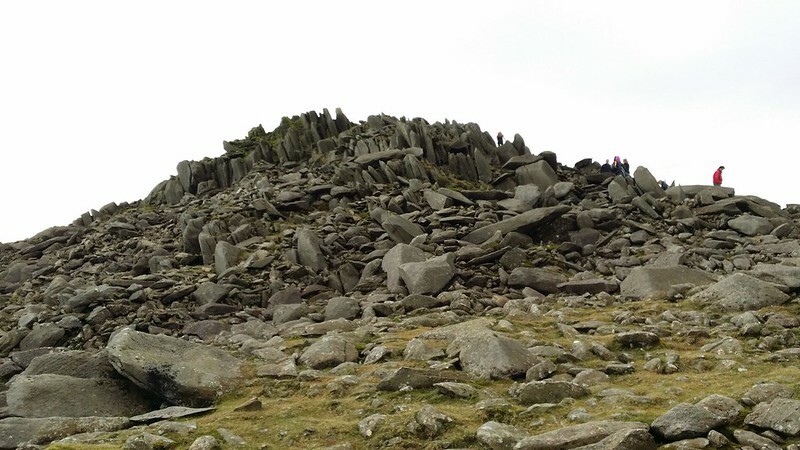 I prowl over the scattered boulders and up to the summit itself. Here there are probably more people than I will see on the rest of the walks on this trip combined. The views are great though, and as the summit was in cloud on my only previous visit, I linger to take them in with a cup of tea. They say too much of a good thing is bad for you though, so I eventually prise myself from my rock seat and make my way towards my next objective: the North Top. This I do have to myself though, lying off the main path and only really visited by people who need it for their Nuttalls collection. 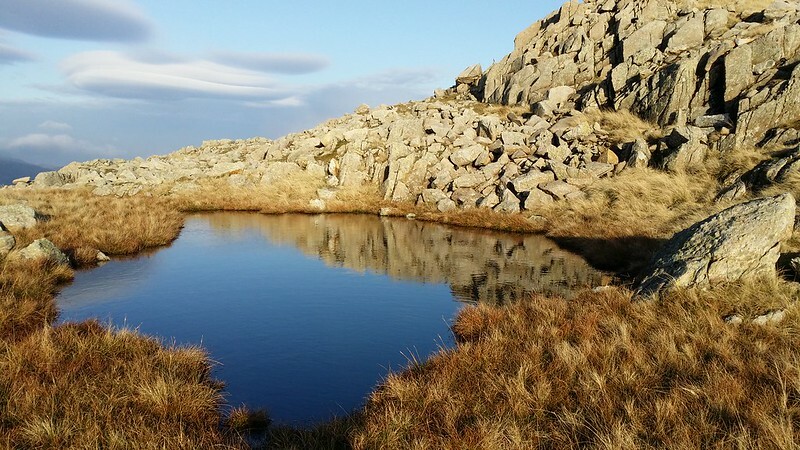 Today provides a good opportunity for a proper look at it, and I find another little tarn on the descent to Ore Gap. Marked on the map, but not recorded by John and Ann, I’m puzzled why both this and the pools on The Band aren’t mentioned – they seem substantial and permanent enough. I guess the only way I’ll find this out is by revisiting after a really dry spell. Esk Pike is soon summited and I can now sense the day waning. 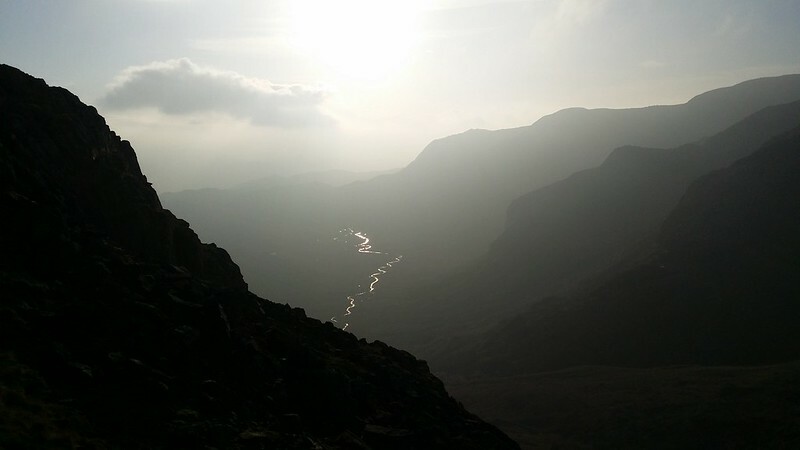 To my left, shafts of sunlight are both illuminating Eskdale and darkening the surrounding fells, with the River Esk appearing as a thin silver snake far below. I’m transfixed and attempt to capture the scene, not altogether successfully. 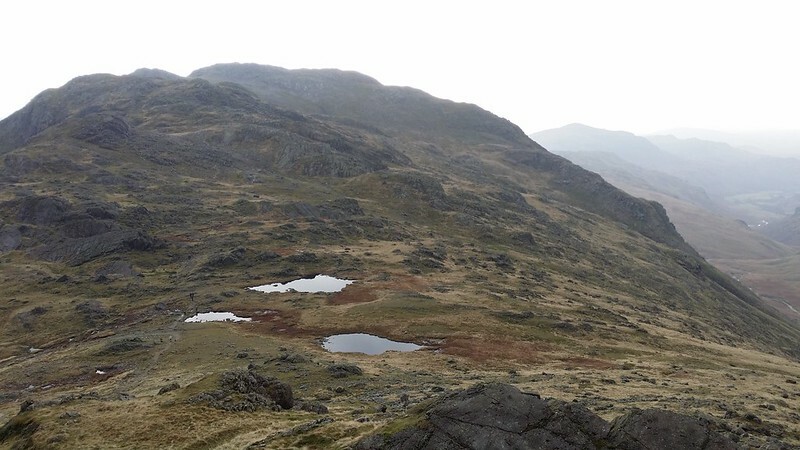 Further ahead, I can see Esk Hause below with a particularly good aerial view of Seathwaite Fell and its tarns. 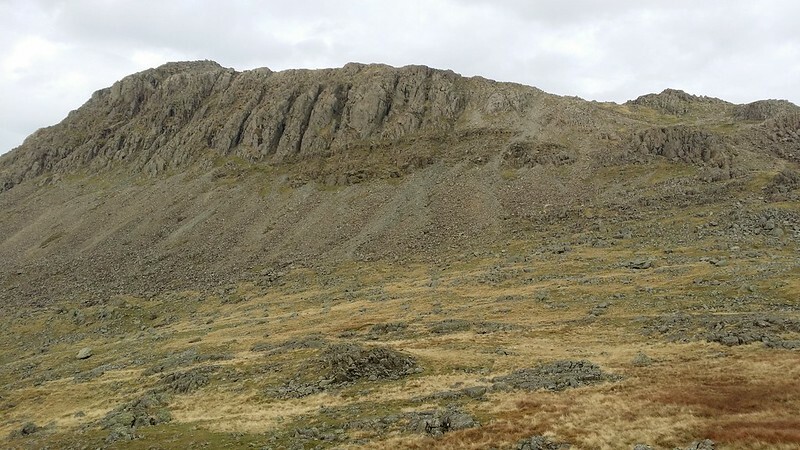 No time to visit today, and similarly I’m doubting that I have time to extend the walk to Great End – another fell I have to return to in order to complete a carless round of the Wainwrights. 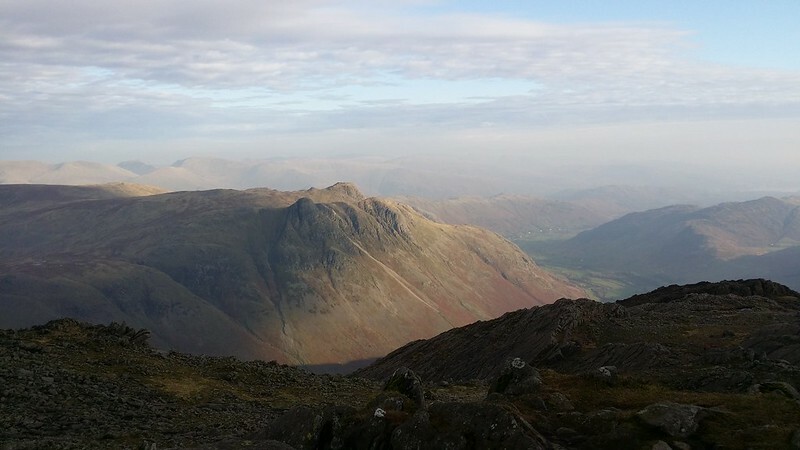 But previous experience of how long the walk from Esk Hause down to Langdale really takes holds me back and I simply make do with the descent to the shelter, shedding layers in anticipation of warmer weather below. 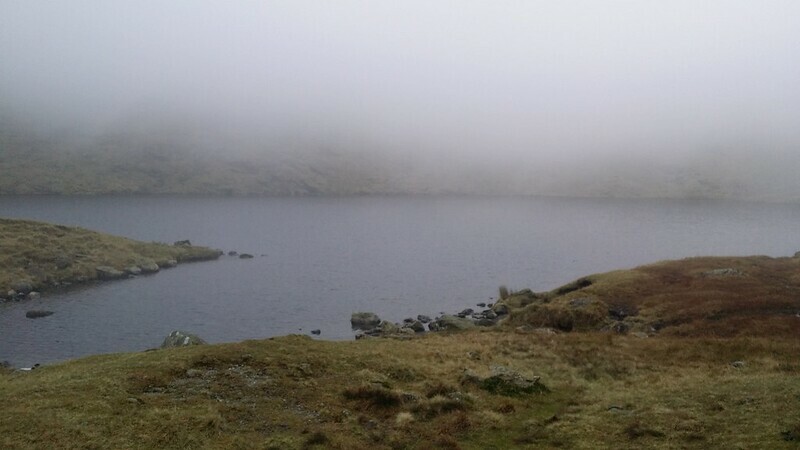 This proves to be a poor choice, and my descent to Angle Tarn is dogged by increasingly cool and misty conditions, the cloud sitting stubbonly in the corrie itself. But I do at least have enough presence of mind to visit the top of Tongue head, metres from the path and always recorded as bagged by Social Hiking on the way past, although this is the first time I’ve actually technically been to the top. I feel less of a fraud now. My calculations now suggest I should be ok to make the last bus, but it’s becoming clear that the last part of the walk is going to be in the dark, and that there will be no time for a pint. I try to shave off what time I can, but the Rossett Gill path goes on and on, and I’ve never been especially rapid down it. 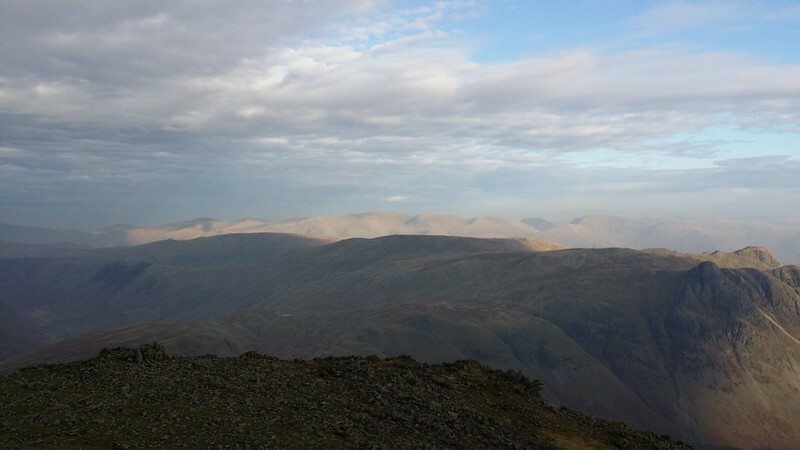 So it’s with a sense of relief that it levels out below Stake Pass, and the Pacerpoles are soon flashing madly as I get the hammer down along the last mile, racing the departing light, and leaving for dust the people who I’ve been playing leapfrog with the whole way down from Esk Pike. Stumbling over small rocks on the last bit, because it just doesn’t feel worth excavating my headtorch for 10 minutes of level walking, I arrive at the ODG with a few minutes to spare before the bus takes me home. An excellent walk with some great pictures. Having to rush back due to public transport is an issue I know only too well and can add a little bit of pressure to the end of a walk. Indeed. This is one of the reasons I usually prefer backpacking so I don’t have to worry about getting “home” at the end of the day. I’ve only missed the last bus once so far though.